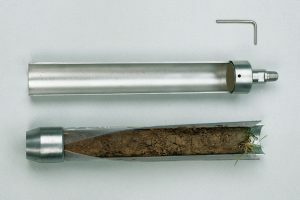 Split Tube Soil Sampler has a diameter of 53 mm and is 40 cm in length. So is ideal for taking rapid undisturbed samples in the top layer. Van Walt offers a series of specialist gouges and augers to ensure you have the right tool to take soil and sediment samples. Split Tube Soil Sampler: a 40cm sampler for the rapid undisturbed sampling of the top layer in medium soils. Ideal for research on root systems, fertiliser, chemical and soil biology.